The thing about Barcelona (and about Spain and many other southern European countries generally) is that proper restaurant-restaurants don’t open for dinner until 8.30 pm or even later. Thankfully, for those of us whose stomachs rumble several times between lunch and dinner, the tapas bars seem to be open at all hours of the day – meaning you can pop in for a drink and a snack whenever suits. And in fact, you might be more likely to score a table at 7.30, à la British-Dutch person. What’s more, the tapas in Barcelona doesn’t stop at patatas bravas and Padron peppers; many Catalan chefs are doing exciting, creative, fusion-style tapas that means you won’t get bored even if you find yourself eating at tapas joints every day (as I did). Not surprisingly, there are probably more tapas bars in Barcelona than there are bikes in Amsterdam, so to imply that I found the “best” in the city is a wild over-statement when I obviously barely scratched the surface. However, the tapas places that follow were recommended to me by trusted sources and were by no means all of those that I tried – so you can be fairly sure that these are a good bet. Bar Mundial (El Born area) – On our first night, we went with a traditional tapas option recommended to us by a colleague who lives in Barcelona. Bar Mundial isn’t exactly convivial – the lighting is fairly brutal and the service was about as unsmiling as Amsterdam on a bad day – but the food was excellent and very good value. 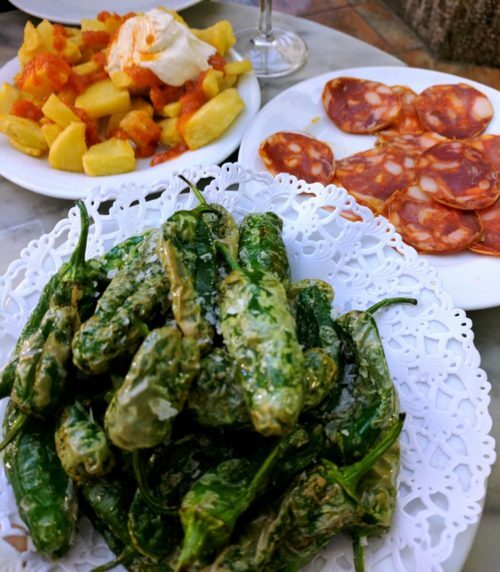 We tried the patatas bravas and pimientos de Padron (come on, it had to happen sometime, and day one seemed as good a moment as ever), as well as a plate of sliced chorizo, and squid with fried jamón. The portions were extremely generous, as was the wine-pouring action – a large glass of full-bodied local red wine cost just €3 and tasted like €8. The only thing that would’ve made us happier was the feeling that they didn’t hate tourists quite as much – but hey, you can’t have everything. Tapas 24 (Dreta de L’Eixample area) – Recommended to me by Food Lovers Company (more on them below), Tapas 24 was conveniently close to my hotel, and turned out to be one of my favourite meals of the trip. I was dining alone that night, and I scored literally the last free spot at the bar. This place was hopping, and it was clear why. They seemed to be known for their huevos rotos (“smashed” eggs over potatoes) so I ordered a half portion with chorizo. They also boasted what I keep describing as a Spanish bitterbal, known far more sexily as “La Bomba de la Barceloneta”: minced, seasoned meat wrapped in potato purée, dipped in breadcrumbs and deep-fried. Savoury perfection, especially with aioli and spicy tomato sauce. 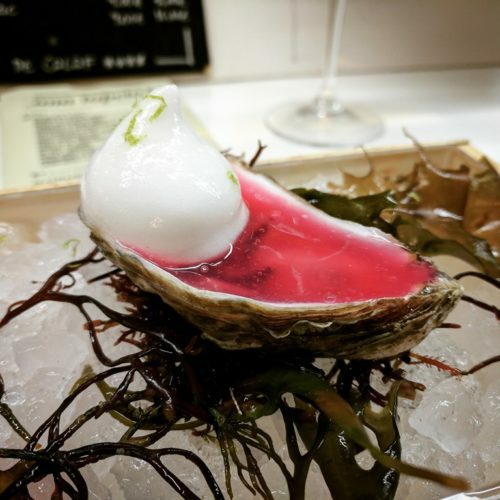 But possibly the most beautiful dish I ate that evening was a single oyster, ceviche-style with lime and a hot and sour pink sauce and a lime mousse. Tongue-tingling! Bar del Pla (El Born area) – Bar del Pla is one tapas bar that required a reservation. Not that it’s fancy – it’s just very popular with locals and visitors alike. I went there on my first “digital nomad date” with a developer from Louisiana who’s working her way around the world. Yes, this is a thing. Bar del Pla’s menu essentially splits down the middle: half traditional Catalan fare, the other half an international fusion of flavours, served tapas-style. I went for the latter and loved it. We ordered everything from king prawn and raspberry uramaki to suckling pig tacos to the heartiest ceviche (served on a tostada) I think I’ve ever eaten. It was all divine, as was the wine. Alternatively, instead of hunting around for the best tapas in Barcelona yourself, you can simply take a tour with Food Lovers Company. 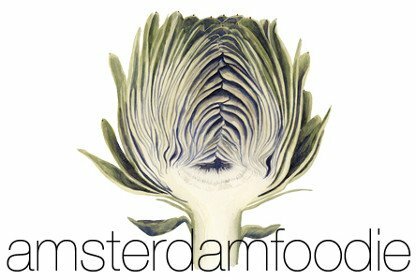 As well as providing plenty of gourmet nibbles, doing a food tour guarantees that you’ll actually learn a bit of history and culture – and as we all know, educating oneself while eating directly negates the calories consumed. The evening I took the Barcelona tapas tour, there were just four people in our group plus the guide – which made it feel more like we were on a night out with a local than on a regimented tour. 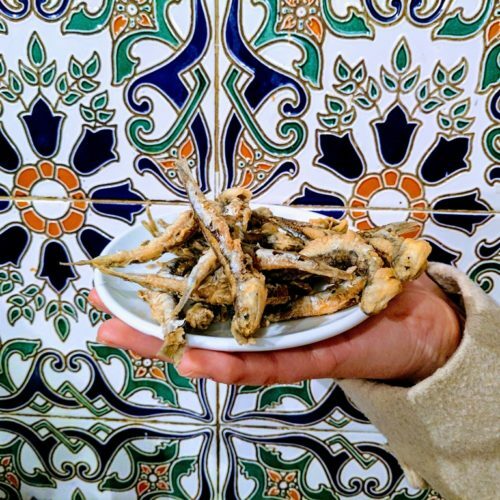 We stopped at four ultra-local places in Barcelona’s Old Town, serving everything from fried anchovies to Catalan cheeses (some of which were even in ice cream form!) 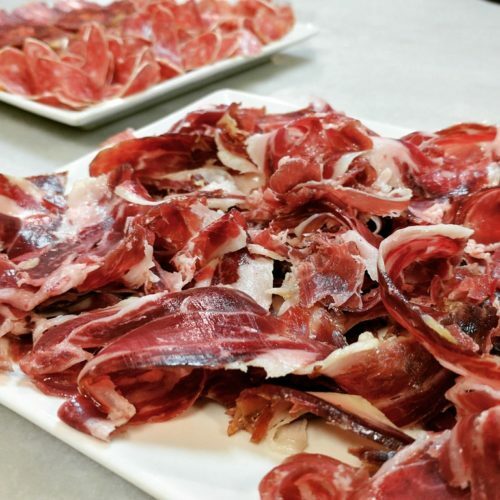 to the most melt-in-your-mouth jamón ibérico de bellota (ham from a specific breed of pig fed on acorns). After one particularly frustrating lunchtime experience that left me about €15 poorer and still hungry, I was quick to discover a wonderful thing: the Menu del Dia. The “Menu of the Day” (but you could probably guess that) generally seems to offer three courses – usually with not much choice and sometimes including a drink and/or coffee – for a very reasonable price. 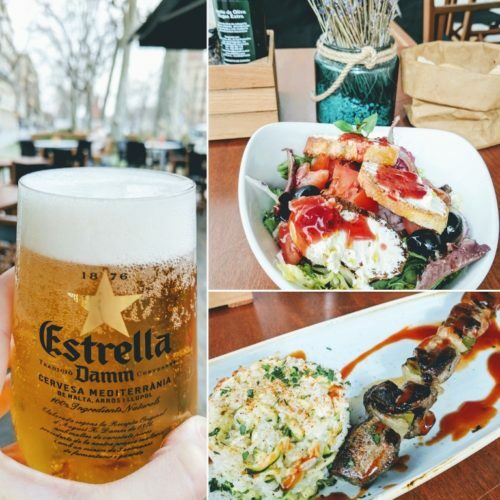 I liked the look of the Menu del Dia at La Foga, not far from the Ciutadella park and the Arc de Triomf, so I stopped in for a beer and a far more satisfying lunch than the day before. There were three or four choices of starter and main course (so still not a disaster if you’re a vegetarian or have dietary requirements), each of which were not uncomfortably large but definitely filled me up. The day I was at La Foga, there was a goat’s cheese salad on offer, plus a skewer of perfectly grilled veal with a timbale of creamy rice and courgette. For dessert, I was feeling a little fruit deprived so I went for a simple plate of sliced kiwi – but there were more decadent options available too. The best bit, however, was the price: €12.90 for the lot. You can’t say fairer than that when you’re on a budget! 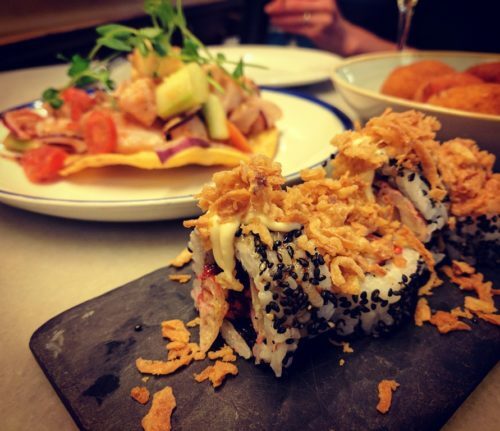 Three courses plus a drink for €12.90 at La Foga! Given its location right on the coast, you can’t come to Barcelona without eating paella – right? Right. 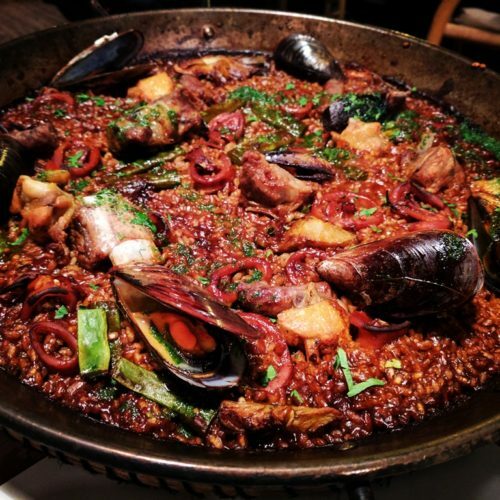 And unsurprisingly, the best paella restaurants seem to be clustered on the bit of land that’s closest to the sea – La Barceloneta. Having tried our luck at Maians restaurant (recommended to us by the same local colleague but mysteriously closed), we ended up just around the corner at Barraca. The restaurant itself is upstairs on the first floor, presumably to make the most of the views over the ocean – not that we could see them because it was February and pitch dark! The paella, however, was not a disappointment. Ours was richly filled with squid, mussels, pork, chicken, runner beans, and plenty more. The rice was dark and sticky, rich with umami flavours that only developed as we kept eating. Paella perfection! It seems odd to end on coffee and breakfast, but this seemed to be arguably the least important meal of the day in Tapas-City. With that being said, there is certainly decent coffee to be had. While I like the fruity but pricy flat white at Satan’s Coffee Co., my favourite spot for a cappuccino and a pastry in the morning was Molika café in the Dreta de l’Eixample area. Plus, they have wifi – ideal if you’re digital nomad-ing for the week, like I was.